Ljubljana Marshes and Ljubljanica river flowing through it are a very important archaeological site in Slovenia. We flew our kite above the place where a Roman boundary stone was found, resolving the question of administrative location of Colonia Iulia Emona (precursor of today's Ljubljana) within the Roman Empire. Kite science: how to defend fragile habitats against invasive weeds - with a kite! 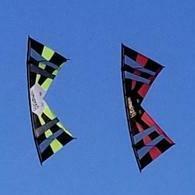 did you ever flew a kite where you felt you shouldn't? We did a kite aerial photography session above a cemetery - and it felt wrong ... our plan was to fly the kite directly above it ant to shoot straight down, but we just couldn't do that - so we flew the kite beside the cemetery ... it was like we were invasive and disrespectful ... like the fun that goes with flying a kite was somehow inappropriate for the place. Had any of you a similar experience?